Amiens (pop. 135,000) is the prefecture of the of the Department de la Somme and the capital of the Picardie region. 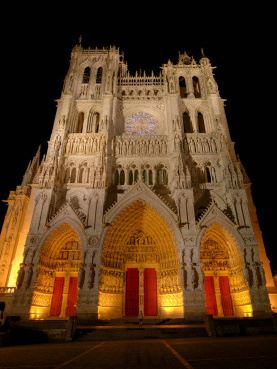 The cathedral and belfry of Amiens are UNESCO World Heritage Sites (since 1981 and 2005, respectively). The region was settled by the Ambiani tribe before the Roman conquest of Gaul. 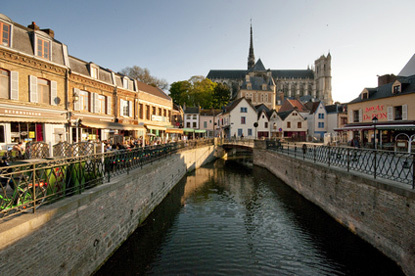 Amiens was then known as "Samarobriva", which in Celtic language means "Bridge (briva) on the Somme (Samara)". Samarobriva was already a major hub in Roman times, on the road between Lyon (Lugdunum) to Boulogne (Gesoriacum). This allowed the city to develop quickly. A vast forum occupied what is now the town hall and the court of justice. There were thermae and an amphitheatre for 15,000 people. In 287, Saint Fermin becomes the first bishop of Amiens. He was beheaded in 303 for preaching Christianism. During Winter 338-339, a Roman soldier, Martinus, shares his coat with a poor man. The soldier would later become known as Saint Martin of Tours. Due to the increasing frequency of Germanic invasions, the amphitheatre of Samarobriva is transformed into a fortress of 20 hectares (50 acres), the largest fortified place in Northern Gaul. This does not prevent the city from being taken successively by the Alans, the Vandals, and the Burgunds. In the 5th century, the King of the Salian Franks based in Tournai, Clodio (396-448), takes control of the region. His son, Merowig, after whom the Merovingian dynasty was named, is proclaimed king in Amiens. Merowig's grandson, Clovis I (466-511), would unify the Franks and conquer the last remnants of the Western Roman Empire, the Domain of Soissons. The Vikings plunder Amiens in 859 and again 882. They burnt down the first cathedral. 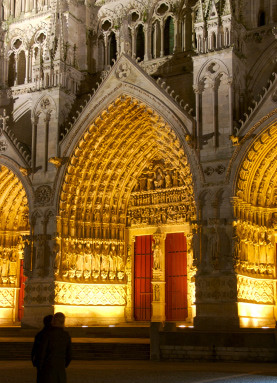 In 1113, Amiens its first charter of municipal rights against the local lord. But Enguerrand de Boves, Count of Amiens, refuses to recognise the charter. King Louis VI then comes to support the bishop against the count. Amiens becomes part of the Royal domain in 1185. It is ceded to the Duke of Burgundy by the Treaty of Arras in 1435, but reacquired by the King Louis XI in 1477. In 1597, the Spaniards capture the city using a Trojan horse technique. King Henry IV will have to besiege the city for six months before taking it back. During the 18th and 19th centuries, Amiens is renowned for its velvet industry. On 25 March 1802, Napoleon Bonaparte obtains a treaty of peace between France and Britain, known as the Treaty of Amiens. Amiens was badly damaged during both World Wars, during the Battle of Amiens in August 1918, and again by German bombing in 1940. The main reason to visit Amiens is for its cathedral, the tallest complete cathedral in France (112.7 m), and second largest in the world in volume (200,000 m³) after Yamoussoukro. 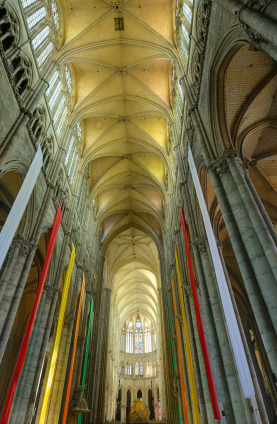 It also has the tallest nave vaults in France (42.3 m). The cathedral was built fairly quickly for its size. The construction began in 1220 and was complete in 1243, apart from the spire that was added in 1528. The city's belfry symbolises the independence of the municipality. The lower part was built between 1406 and 1410, while the Baroque clock tower dates from 1749. Facing the North Station, the Perret Tower was one of Europe's first skyscrapers when it was constructed (between 1948 and 1954). It has 29 floors and rises to 110 meters (only 2 meters shorter than the cathedral's tower). Also of interest is the octagonal Municipal Circus, built in 1889 and inaugurated by Jules Verne, an elected town councillor of Amiens from 1888 to his death in 1905. Amiens is a major road hub in northern France. It sits at the junction of the A16 motorway and N1 road to Paris (135km), Beauvais (60km) and Boulogne-sur-Mer (130km), the E44 between Le Havre (185km) and St. Quentin (85km), and the N25 road to Arras (75km). Amiens can also be reached conveniently by train from Paris (1h10min, 17.90 €), Arras (50min, 10.30 €), Lille (1h20min, 17.50 €), St. Quentin (1h, 13.30 €) or Boulogne-sur-Mer (1h30min, 17 €).